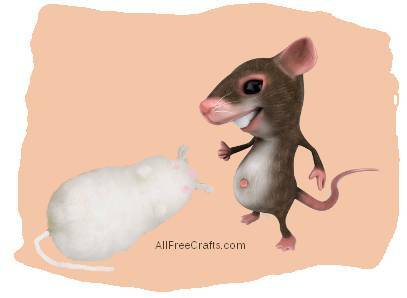 Use fluffy pompoms to make a furry little mouse friend – ours is a little pet white mouse with pink ears, but you could use brown, tan or grey pompoms to represent a field mouse. Glue together a large and medium white pompom and allow the glue to dry. Glue together the 2 teeny white pompoms and 1 teeny pink pompom, in a triangle shape. This will be the mouse’s nose. Set aside for the glue to dry. Trim away one side of the large and medium pompom until it is flat and level. The will be the bottom of the mouse’s tummy. 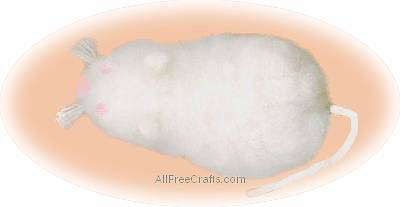 Trim away the medium pompom until you have a shape of a mouse’s head. Refer to photo. The face will be almost a complete triangle. Now that the face has the right shape, trim into the large pompom (body) just a little to even the edges between the large and medium pompom. Cut a double strand of embroidery thread (12 strands in total) and glue at the tip of the triangle (this will be the mouse’s whiskers). On top of the embroidery thread, glue your 3 teeny pompoms (glued together previously) to create the nose. Trim away 2 small white pompoms to a V shape. This will make the mouse ears. Glue the mouse ears in place (refer to photo). To make the eyes, I cut a little fluff from a teeny pink pompom and rolled the fluff between my fingers to pack it together a little. Then, I glued the fluff for eyes. Be sure that the glue is applied to all of the fluff, or the eyes will not stay in place. You can also use buttons or teeny wiggly eyes for this. To make the tail, cut a very thin piece of craft foam (approximately 4 inches long) in an irregular line, creating a little bit of a point at one end. Glue the end without the point onto the mouse body. Again, refer to photo for placement.